This has been a long week of reviewing for me, and as a matter of fact, I just couldn’t fit the final day in before having to record the podcast. The Survival Summit is a 6 day long presentation of interviews by survival and preparedness experts from all aspects of the mindset. Brought to you by the guys behind The Prepper Project, this event has proven to be overflowing with information ranging from food preservation to battle techniques. I’ll go over the presentations day by day and point out my favorites and what it was that made them hit the top of my list. Some of the presenters include: Marjory Wildcaraft, Steven Harris, Paul Wheaton, Chance Sanders, and more. Of course, the whole event is almost over now, but it is available by subscription. Unlimited downloads and complete access for $67.00 US. If you have the money to spend, it’s well worth it. I’m sure you’ll find, as I did, that there is a lot to learn even about the topics you thought you had covered A to Z.
I did say in the forum that I would not join as an affiliate to make money, but I thought this was such a good presentation, that I have signed up and will be putting EVERY PENNY I earn from this back into The Canadian Preppers Network in one form or another. Perhaps getting some membership pins made, or maybe getting some prizes to give away, or something like that. 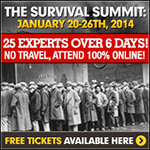 So, if you’re interested, click on the Survival Summit link to get full access to it all. Listen to this broadcast on The Survival Summit In Review in player below! Next: Next post: America On the Dole-The Buck Stops Where?